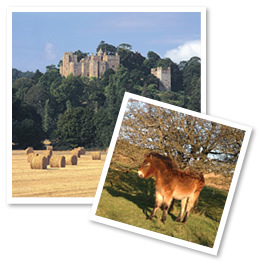 Looking for holiday accommodation or cottages in Exmoor or information on the area? Then look no further! 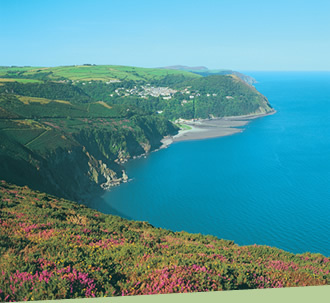 This is the 2019 edition of the Exmoor Coast & Country Accommodation and Short Breaks Guide. Here you will find information on the area and all types of accommodation - from cottages to Bed & Breakfast - in fact everything you need to plan your holiday. EXMOOR, Still England... but another World. It’s when you spot your first herd of red deer bounding through the bracken, or ride your horse to the crest of Dunkery Beacon or drink in the wild views around Pinkworthy Pond, that the Exmoor area really gets hold of you, body and soul. There are fine country houses in and around the region, meltingly lovely beauty spots, thriving market towns and a coast more remote, thickly wooded and wild than any in the West Country. There are red deer and Exmoor ponies living wild on the moors, peregrines and red kites on the cliffs, otters and dippers along the brawling moorland rivers. Farmers, foresters, fishermen, gardeners, shopkeepers, craftspeople, wardens — all have time for a chat. That is the way they like to live on Exmoor. Bucket and spade, saddle and bridle, boots and backpack, picnic hamper and driving gloves – it is up to you what you make of Exmoor. It’s all here, naturally. Included within this site is all you need and more to enjoy your holiday, select your accommodation and plan your whole visit. This is the main Exmoor Tourism Portal for local information and holiday accommodation, whether it is a cottage, hotel, camp site or bed and breakfast, in the Greater Exmoor Area - which is the Exmoor National Park and surrounding areas, in both Somerset and Devon, including the coastal regions. Please enjoy your visit and this site.